Proof coins are popular products among numismatists that desire a diverse and brilliant collection of coins. 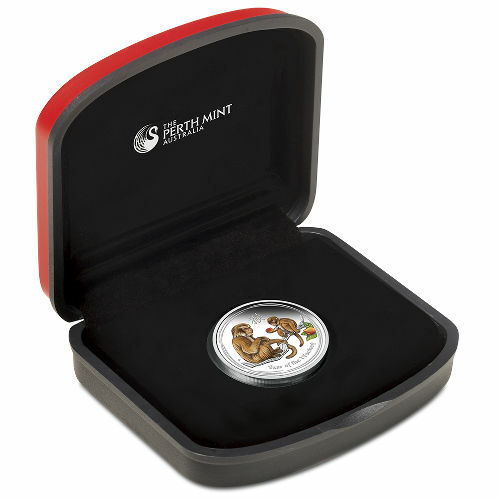 The Perth Mint is one of the foremost producers of proof coins, and its Lunar Series II coins are among the most popular. Now, this popular series has added brilliance courtesy of colorized finishes. 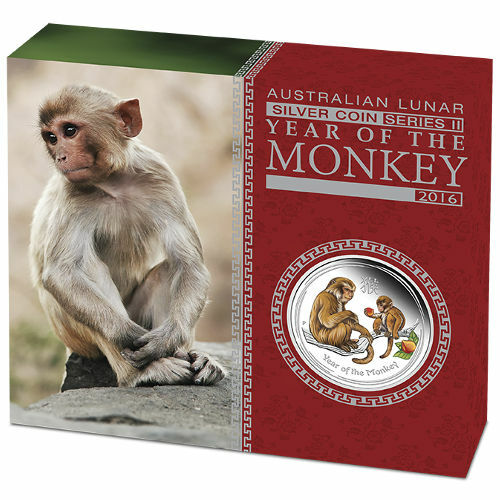 Today, the 2016 ½ oz Proof Colorized Silver Australian Monkey is available on Silver.com in BU condition. Just 10,000 coins will be minted by the Perth Mint! Consists of one-half troy ounce of .999 fine silver. Face value of $.50 (AUD) backed by the Australian government. Features a colorized finish on the Year of the Monkey design. Struck in a proof finish. Arrives in a presentation, themed box with a Certificate of Authenticity. The Perth Mint’s Lunar Series II program is a diverse series of coins that offers something for everyone. The coins are available in both gold and silver, with bullion and proof versions struck each year. 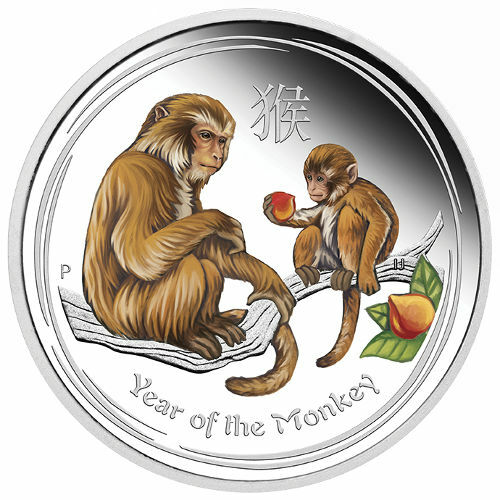 The 2016 coins all feature a unique Year of the Monkey design, with similar concepts but different details on the gold and silver versions. 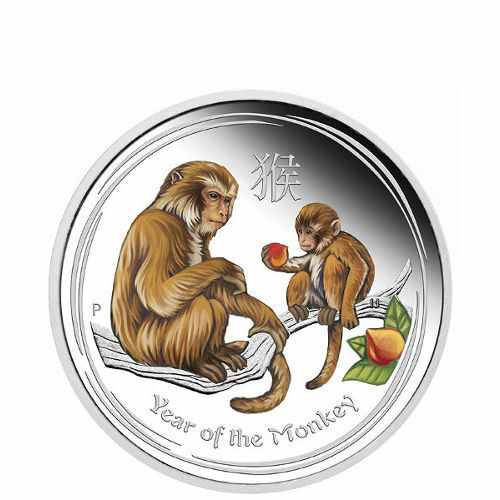 2016 ½ oz Proof Colorized Silver Australian Monkey Coins have the same design found on the standard Silver Australian Monkey proof coin, but natural hues and tones have been added to the primary design to enhance visual appeal. The monkeys in the design have shades of brown and white on their bodies, while branches, leaves, and peaches in the design also have real-world colors. On the reverse face of the 2016 ½ oz Proof Colorized Silver Australian Monkey coin is the Year of the Monkey image, which includes two monkeys in a peach tree. Designed by Ing Ing Jong, the imagery is symbolic of longevity and peach. 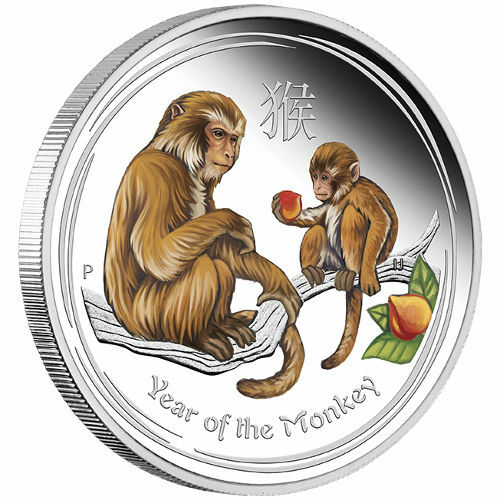 Engravings include the Chinese symbol for monkey, the phrase ‘Year of the Monkey,” and the “P” mint mark. The obverse bears Ian Rank-Broadley’s 1998 design of Queen Elizabeth II. Her Majesty’s right-profile portrait has not been altered in any way, and the coin’s obverse remains the same as the bullion and proof versions. Each coin available on Silver.com is in BU condition, which means you’ll find no signs of wear and tear. Silver.com welcomes customer inquiries and encourages you to ask questions. You can reach our associates at 888-989-7223, connect with us online using our live chat, or submit your questions via email. If you are interested in similar products, be sure to check out our full selection of Silver British Coins.